This book was recommended to me by my dad’s colleague. She said it was an extraordinary book and after reading it, I must say I agree. Niamh has been separated from her family. 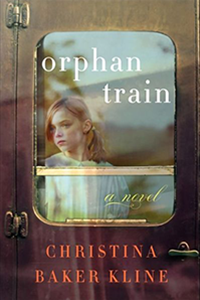 She is being taken west on the Orphan Train – a train that transports orphans from the East Coast to the Midwest. She makes new friends but they are all eventually adopted. However, nobody wants a skinny, Irish, nine year-old girl. Niamh is finally adopted by a woman who is looking for a new seamstress. Due to the Great Depression, Niamh is kicked out of her first home. Niamh, or Dorothy, as they call her, is now looking for a new family. Her foster care agent find her a home with an abusive mother, a no-good father, and their four undernourished children.